It’s amazing how many faces you recognize when you visit a place often enough; even at a place that receives more than 500,000 visitors a year, like Lake James State Park. When you’re a “regular” you get to know the other “regulars”- and so many of you reading this already recognize the face looking up from the page. Since she was 5-years-old, Audrey Elliott has been a dedicated supporter of Lake James State Park. She earned her first Junior Ranger badge here and has gone on to collect 21 others at parks across the state and she’s only a fourth grader! She also holds 21 junior ranger badges from national parks. Recently, Audrey was introduced as the National Parks Trust’s third Buddy Bison Student Ambassador in the National Parks Service Annual Report. With her two fellow ambassadors, Audrey is expected to continue her work in schools to encourage and inspire young people to take advantage of the National Parks System. “My job is to get kids in parks and show them they can have fun and learn at the same time,” she said. In spite of her national recognition, Audrey continues her volunteer efforts at her “hometown” park. She’s currently working with Ranger Kevin Bischof to construct a bat box from materials funded by area businesses, which she lobbied. Audrey has also helped refurbish the interactive stations along the Holly Discovery Trail and she remains dedicated to keeping Lake James beautiful. “I pick up trash every time I go out on a trail,” she said proudly. 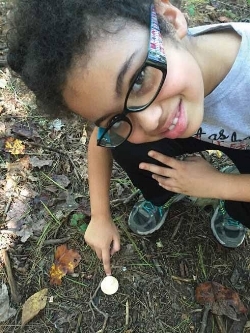 Now that you know the story behind this familiar face, be sure to give Audrey kudos the next time you see her working, learning and playing at Lake James State Park.